Because strokes affect your brain, one of the most complex parts of your body, no two people have exactly the same effects after a stroke. Strokes may impede your ability to walk, talk, eat, interact with others, or some combination of those activities. 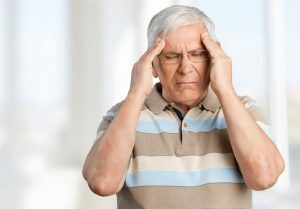 Strokes alter basic daily functioning, which can make returning to normal life after a stroke frustrating and difficult. Every person will go through a different recovery process, and some will recover more completely than others. However, we've listed a few common steps that stroke survivors and their loved ones may take after a stroke. Identifying the Challenges Some challenges that come with a stroke may be obvious to everyone, such as losing the ability to walk. Other challenges, however, may be more difficult to spot and more emotionally charged for family members. Some people experience personality changes after a stroke, like becoming more careless and forgetful or more irritable and depressed. These emotional challenges can cause strains in their relationships, but can become easier to deal with when loved ones recognize that they are results of the stroke. Talking to your doctor or another professional may help you identify these types of challenges. Looking for Support Over 7 million Americans survive strokes every year, so if you or a loved one has experienced a stroke, you are not alone. Everyone has different experiences after their stroke, but finding support from others who are going through something similar can be helpful for stroke survivors and their loved ones. Other people may be able to offer advice, resources, or simply a sympathetic ear when it's needed. Many people connect to stroke support groups for help and friendship. Finding Ways to Overcome While some challenges after a stroke can be overcome, others may remain with you for the rest of your life. Finding ways to cope with your new challenges can be frustrating and overwhelming, but there are many resources available to help you. In addition to the expertise offered by physical therapists, occupational therapists, and other professionals, there are plenty of resources online and in communities. For example, the Stroke Association keeps a library of daily living tips with ideas for coping with daily challenges faced by stroke survivors. Seeking Stroke Rehabilitation Many stroke survivors find that rehabilitation is the most important and helpful part of their recovery. Rehabilitation can offer help in identifying challenges, emotional support, and professional expertise in coping with new challenges. Rehabilitation after a stroke is different for every person, because every stroke survivor has different challenges. Rehabilitation may help with self-care skills like feeding and dressing, mobility skills like walking or using a wheelchair, communication skills like speaking, cognitive skills such as problem solving or remembering, and social skills for interacting with others and dealing with emotions. It sometimes also involves more advanced skills, like re-learning how to drive or vocational training so that you can return to work. Rehabilitation takes place in a variety of settings, from long-term in-patient care facilities to outpatient facilities you may visit a few times a week. It's also conducted by a wide variety of professionals, including nurses, physical or occupational therapists, speech-language pathologists, social workers, and audiologists. Where to Find Rehabilitation Many different types of facilities offer rehabilitation for strokes, including Maplewood of Sauk Prairie. Maplewood has many highly competent, caring staff who enjoy working with stroke patients to regain as much functioning and mobility as possible. We offer an intensive and well organized program that will be targeted to meet your unique needs. If you are interested in setting up a post-stroke rehabilitation program for yourself or a loved one, please give us a call at (608) 643-3383. 2010 for stroke-related medical costs and disability. It is extremely beneficial to be able to identify when someone is having a stroke. The faster they are able to get medical attention, the better their chances of recovery are. To identify someone who is having a stroke, remember the acronym FAST. F: Face Drooping – Does one side of the face droop or is it numb? Ask the person to smile. Is the person's smile uneven? A: Arm Weakness – Is one arm weak or numb? Ask the person to raise both arms. Does one arm drift downward? S: Speech Difficulty – Is speech slurred? Is the person unable to speak or hard to understand? Ask the person to repeat a simple sentence, like "The sky is blue." Is the sentence repeated correctly? T: Time to call 9-1-1 – If someone shows any of these symptoms, even if the symptoms go away, call 9-1-1 and get the person to the hospital immediately. Check the time so you'll know when the first symptoms appeared. Identifying the symptoms of a stroke and getting prompt medical attention can make all of the difference in the lasting effects and the recovery of the stroke victim. Because strokes affect your brain, one of the most complex parts of your body, no two people have exactly the same effects after a stroke. Strokes may impede your ability to walk, talk, eat, interact with others, or some combination of those activities. Strokes alter basic daily functioning, which can make returning to normal life after a stroke frustrating and difficult. Every person will go through a different recovery process, and some will recover more completely than others. However, we’ve listed a few common steps that stroke survivors and their loved ones may take after a stroke. Some challenges that come with a stroke may be obvious to everyone, such as losing the ability to walk. Other challenges, however, may be more difficult to spot and more emotionally charged for family members. Some people experience personality changes after a stroke, like becoming more careless and forgetful or more irritable and depressed. These emotional challenges can cause strains in their relationships, but can become easier to deal with when loved ones recognize that they are results of the stroke. Talking to your doctor or another professional may help you identify these types of challenges. Over 7 million Americans survive strokes every year, so if you or a loved one has experienced a stroke, you are not alone. Everyone has different experiences after their stroke, but finding support from others who are going through something similar can be helpful for stroke survivors and their loved ones. Other people may be able to offer advice, resources, or simply a sympathetic ear when it’s needed. Many people connect to stroke support groups for help and friendship. While some challenges after a stroke can be overcome, others may remain with you for the rest of your life. Finding ways to cope with your new challenges can be frustrating and overwhelming, but there are many resources available to help you. In addition to the expertise offered by physical therapists, occupational therapists, and other professionals, there are plenty of resources online and in communities. For example, the Stroke Association keeps a library of daily living tips with ideas for coping with daily challenges faced by stroke survivors. Many stroke survivors find that rehabilitation is the most important and helpful part of their recovery. Rehabilitation can offer help in identifying challenges, emotional support, and professional expertise in coping with new challenges. Rehabilitation after a stroke is different for every person, because every stroke survivor has different challenges. Rehabilitation may help with self-care skills like feeding and dressing, mobility skills like walking or using a wheelchair, communication skills like speaking, cognitive skills such as problem solving or remembering, and social skills for interacting with others and dealing with emotions. It sometimes also involves more advanced skills, like re-learning how to drive or vocational training so that you can return to work. Rehabilitation takes place in a variety of settings, from long-term in-patient care facilities to outpatient facilities you may visit a few times a week. It’s also conducted by a wide variety of professionals, including nurses, physical or occupational therapists, speech-language pathologists, social workers, and audiologists. Many different types of facilities offer rehabilitation for strokes, including Maplewood of Sauk Prairie. Maplewood has many highly competent, caring staff who enjoy working with stroke patients to regain as much functioning and mobility as possible. We offer an intensive and well organized program that will be targeted to meet your unique needs. If you are interested in setting up a post-stroke rehabilitation program for yourself or a loved one, please give us a call at (608) 643-3383. According to the American Stroke Association, Stroke is a disease that affects the arteries leading to and within the brain. It is theNo. 5 cause of death and a leading cause of disability in the United States. 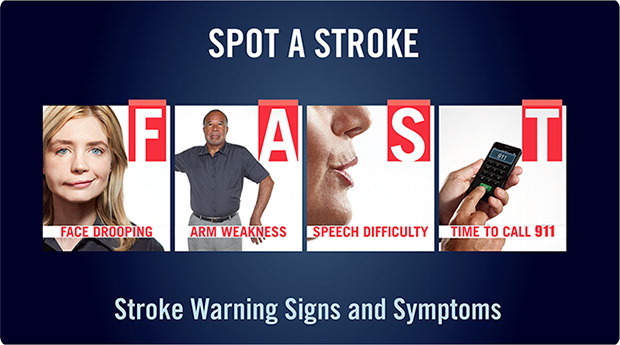 It is extremely beneficial to be able to identify when someone is having a stroke. The faster they are able to get medical attention, the better their chances of recovery are. To identify someone who is having a stroke, remember the acronym FAST. F: Face Drooping – Does one side of the face droop or is it numb? Ask the person to smile. Is the person’s smile uneven? S: Speech Difficulty – Is speech slurred? Is the person unable to speak or hard to understand? Ask the person to repeat a simple sentence, like “The sky is blue.” Is the sentence repeated correctly? T: Time to call 9-1-1 – If someone shows any of these symptoms, even if the symptoms go away, call 9-1-1 and get the person to the hospital immediately. Check the time so you’ll know when the first symptoms appeared. Identifying the symptoms of a stroke and getting prompt medical attention can make all of the difference in the lasting effects and the recovery of the stroke victim.